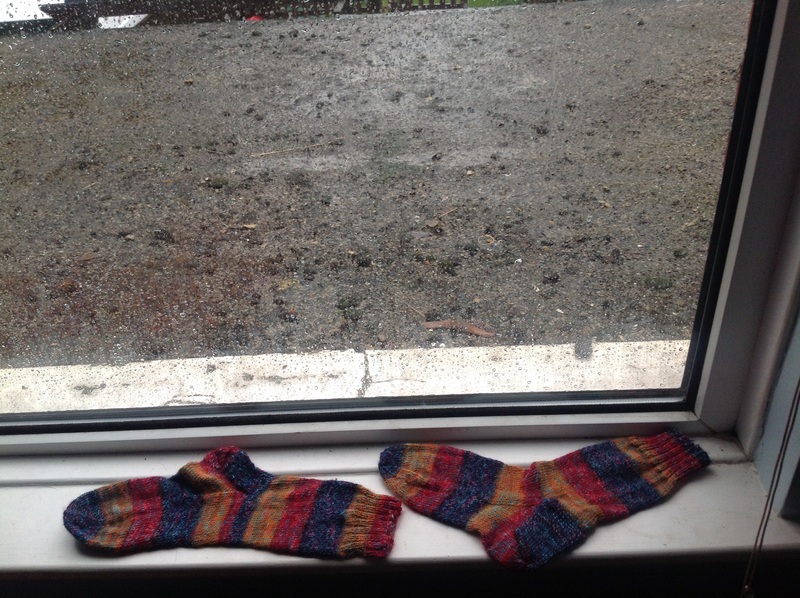 I am very pleased to say that I have finished this pair of socks last night. They are for Paul’s birthday, that’s the first pair of socks I have ever knitted. Actually my very first sock was for Thom, but I’m still to knit the second one. So technically it’s not really finished yet… (Unless I make him hop on one foot?). I have set myself the challenge to knit enough pairs of socks to keep the three of us fully stocked up for this winter. 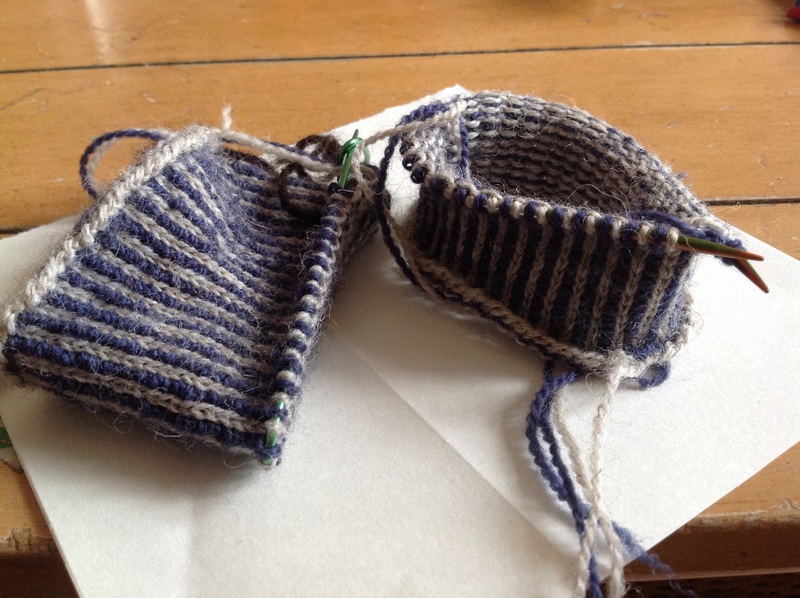 I’m very pleased because knitting socks is something I have been wanting to do since I started knitting again, in 2009. Back then I bought a book on how to do it, some double pointed needles, and even some yarn especially for that purpose but somehow, it felt too difficult. I felt that I wasn’t going to be able to understand the patterns fully. English is not my mother tongue and I used to find knitting patterns in English a bit daunting… To me it seemed like I’d have to learn another language within the English language. A few projects later and somehow I felt confident enough to do it. I had been working on that pullover for months. This project had been following me everywhere since I casted it on in February. It went to Cornwall twice. It has seen hours of Thom’s gymnastic lessons. And hours of various Home Ed activities and meet ups, out and about, on several beaches, in a few pubs and restaurants… I wouldn’t go anywhere without it. It turned out the voice was right. They are too tight. 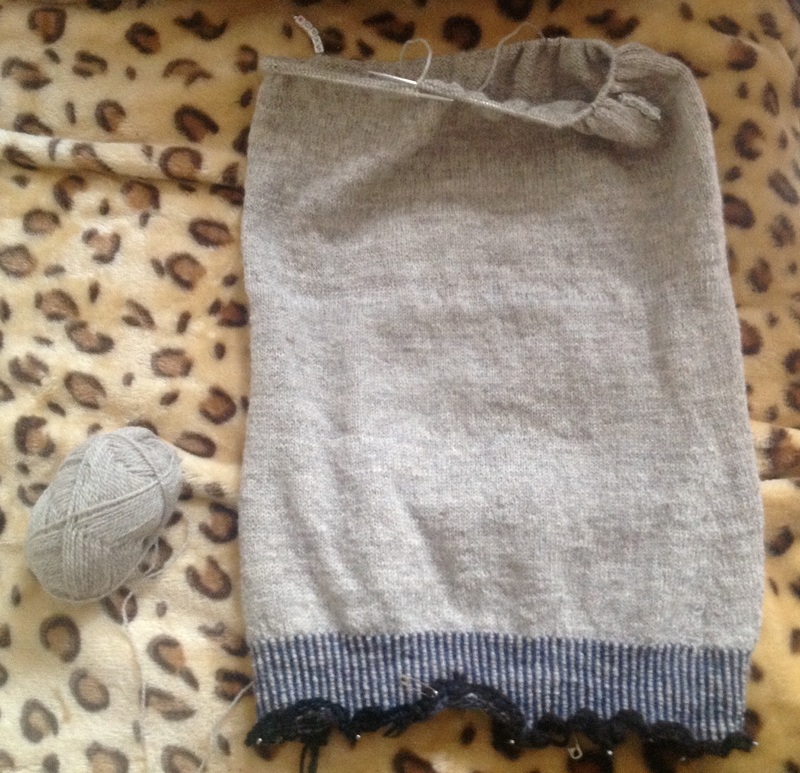 I’m not exactly clear on wether there is a mistake in the version of the pattern I bought or if my gauge is just too tight with the small circular needles I have used to knit these sleeves. Either way. They are attached to the sweater, and I now need to unravel quite a fair bit to remove them. At the time I was a bit disappointed. So I did what every sensible knitter would do in such difficult times: I took a break from this project and started knitting socks. This project is nicely folded in a bag, sitting still, on a shelf. Whenever I will feel ready, I’ll unravel a big part of it and get on with it, without complaining. One day, I’ll triumphantly publish pictures of this pullover on this blog, to tell the world that I have conquered it. Not today though. Today I’m enjoying my personal achievement: I have finished my first pair of socks last night. I finished them in the middle of the night and blocked them straight away before going to bed. 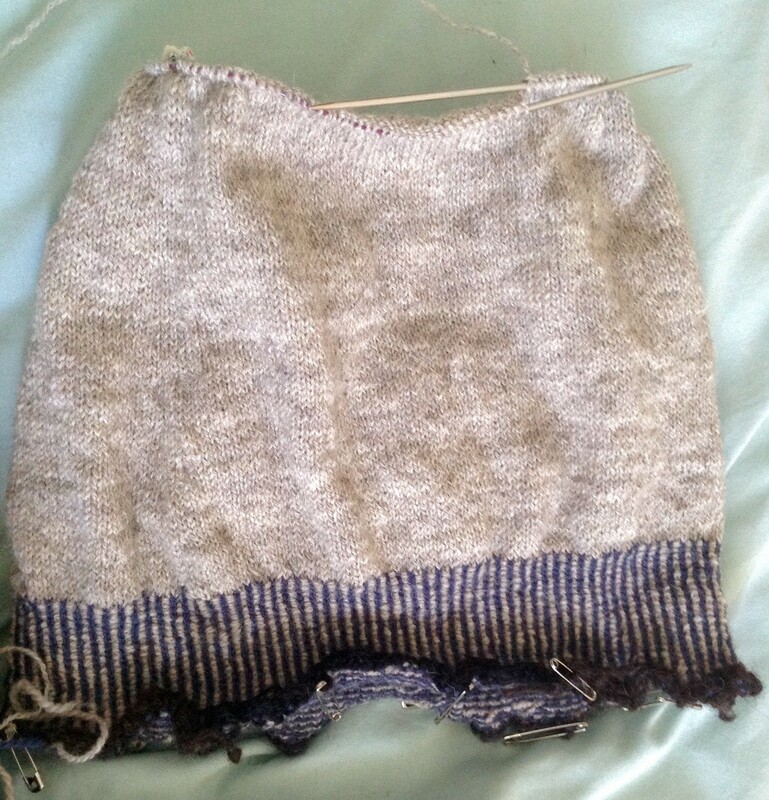 As soon as I half opened my eyes this morning… I casted on a new sock, with some vintage yarn my mum gave me when she last came to visit in May. 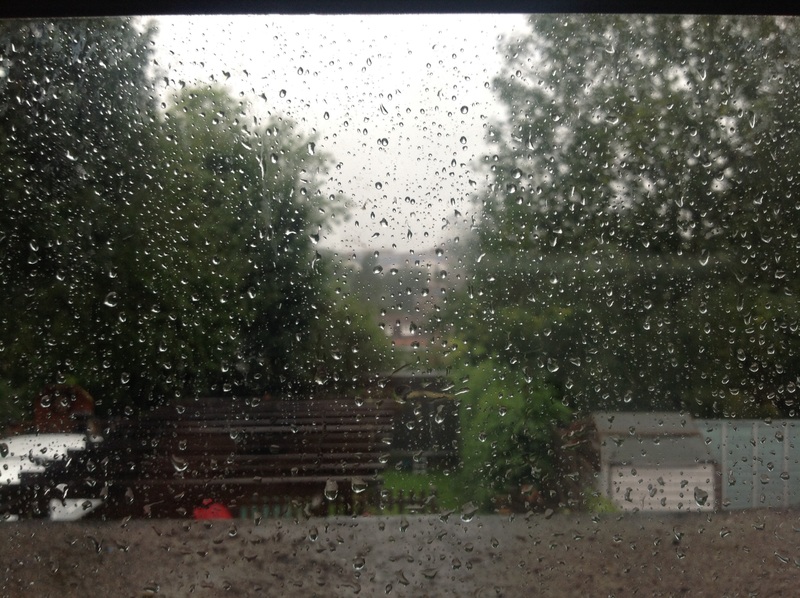 Torrential rain outside. Good knitting weather.